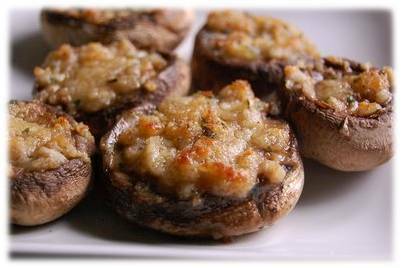 This stuffed mushroom recipe has converted many people who have been adamant about not liking mushrooms into mushroom lovers. Many people don't like mushrooms because of its unique spongy texture, but stuffing them with fresh ingredients and grilling these mushrooms make them a great appetizer dish that is sure to convert any skeptic. Make sure you follow the step-by-step instructions in order to make these mushrooms turn out as best that they can. There are a couple tips that will help make the recipe easier to prep and make the mushrooms not turn out soggy. Set out your cream cheese on the counter so it can begin to soften. This will make it more pliable and easier to mix once you get to the step of mixing all of your stuffing ingredients. Place your slices of bacon in a skillet over medium heat and cook until golden brown. Drain all of the fat and pat the cooked bacon dry with a couple paper towels. Bacon is extremely greasy so patting it dry is an important step in making these mushrooms. Grab your mushrooms and detach the stems with your hands. Make sure there is enough room inside the caps in order to stuff the mushrooms with the mixture. If your stems break off and don't make a little pocket for you to place your stuffing in, just take a spoon and hollow out a little spot. Do not discard the stems, you will use about 1/4 of these as part of the stuffing mixture. Next, take a moist paper towel and rub your mushrooms down to remove any excess dirt. Do not put much water on your paper towel or put them under the faucet. Mushrooms are essentially a sponge that will hold in the water and give you a soggy result if you use too much water to clean them. Get out a cutting board and cut your 1/4 of an onion, slices of bacon, 1/4 of your mushroom stems and jalapeno pepper into fine pieces. Make sure you remove the seeds on your jalapeno pepper and dispose of these as you are cutting it open. Mix all of your chopped ingredients in a large mixing bowl along with the cream cheese. Make sure everything is mixed evenly so each mushroom will have stems, jalapeno, onion, and bacon inside. Place your stuffed mushrooms on a foil sheet and place them on the grill over medium-high heat. Your foil will prevent your mushrooms from burning on the bottom and make the heat surround the entire mushroom and stuffing mix. Make sure you close the lid on your grill to achieve this residual heat effect. Your mushrooms will take about 12 minutes to cook. At about the 10 minute mark, you can put the shredded cheese over the top of your grilled stuffed mushrooms to melt right over the top.